FREE UP MEMORY TO MAKE MORE MEMORIES. PLEASE NOTE: THIS PRODUCT IS SHIPPED WITHOUT RETAIL PACKAGING. Quickly and easily transfer your files between OTG-enabled Android™ smartphones and tablets(1) and PC and Mac computers. The SanDisk Ultra Dual USB Drive 3.0 makes it easy—and fast—to free up space for photos, videos, songs, and more. Please note: This product is shipped without retail packaging. Transfer from your flash drive to your computer’s USB 3.0 port at the no-wait rate of up to 150MB/s(3). Speed like this makes it possible to move whole movies, audiobooks, or music libraries in just seconds. And that helps make your Android smartphone the ultimate on-the-go entertainment device as well your favorite camera. Offering 256GB(2) of storage, SanDisk Ultra Dual USB Drive 3.0 gives you more than enough capacity for large digital photo or music libraries and plenty of room to move yesterday’s videos off your phone so you have room to capture what’s happening today. Download the SanDisk Memory Zone app from the Google Play™ Store(4) and use it to monitor available memory and efficiently manage, organize, and back up files stored on your Android smartphone. 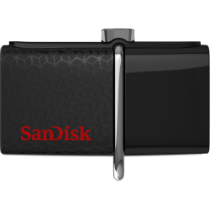 The SanDisk Ultra Dual USB Drive 3.0 is compatible and works instantly with PC and Mac computers running Windows Vista, Windows 7, Windows 8, Windows 10, and Mac OS 10.6+—no drivers required. It is backed by a five-year limited warranty(5). Compatibility: USB 3.0 (backward compatible with USB 2.0)Automatically-detected when connected to an OTG-enabled smartphone or tablet. Requires Android™ smartphone or tablet with On-The-Go (OTG) compatibility. See www.sandisk.com/dualdrive for a list of compatible devices.